Received two announcements about special events this Memorial Day weekend, 2010, on the Delaware River Railroad Excursions, Phillipsburg, NJ. Trains leave their station located at Market Street and the river, Phillipsburg, NJ. More information about the train, special events, and the people behind it all at their web site. 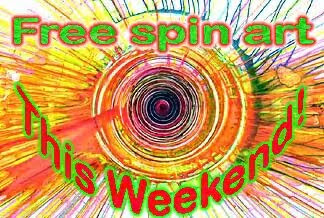 This Memorial Day weekend enjoy FREE SPIN ART at the mine! All ticketed passengers are welcome to join us to explore their artistic side and just have fun doing Spin Art! To enjoy the free spin art you must detrain at the Ol' Susquehanna Mine. Trains leave the mine every 1.5 hours so bring a Picnic or just relax in our beautiful picnic grove. You may also enjoy the Gem Stone Mine for an additional fare. See the following web page for more information about the Mine Train. Enjoy a scenic journey along the banks of the Delaware River as your wine train car rolls behind New Jersey's only operating steam locomotive, Engine #142. 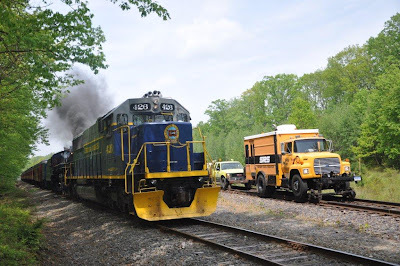 Owned and operated by Delaware River Railroad Excursions, a Non-profit, 501 ( c ) 3 corporation, this historic train is staffed almost entirely by volunteers devoted to trains. Your train conductor will point out interesting facts as you travel along the Delaware, You will transfer to a bus for a brief bus ride through Warren County's picturesque rolling farmlands to Villa Milagro Vineyards. There you will tour their vineyards to learn how grapevines turn soil, sun and water into grapes. Next, you will learn how wine is made, aged and bottled. Finally you will sample their delicious wines. You may purchase their wines at the "source." Bring a picnic lunch, open a bottle of their wine, and relax on the porch to drink in views of four counties in two states. Read about the winery at http://www.villamilagrovineyards.com/. 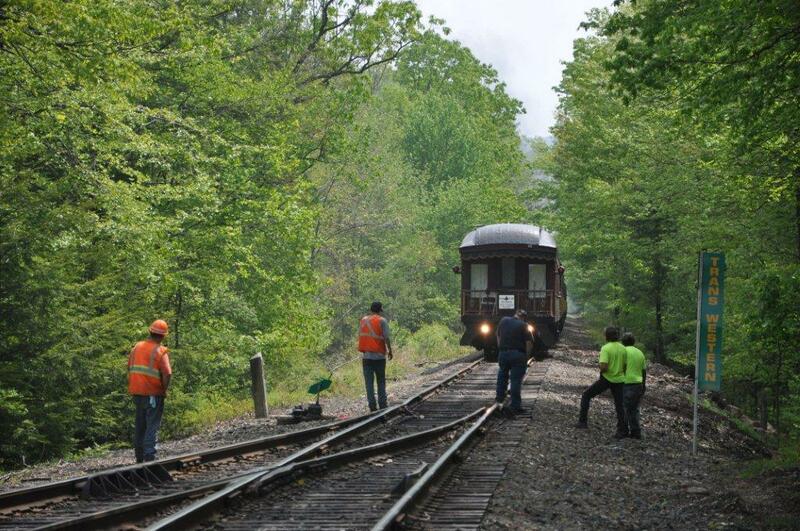 Trains depart Phillipsburg at 11:00 AM. Use discount code dowt142 for 10% off your order while ordering online or present this coupon at the ticket office the day of the ride. Saturday saw an Air Products heat exchanger high/wide load coming down the LEHL. It's journey started at the Air Products facility in Wilkes-Barre (PA), went to Bethlehem (PA), was seen here in Manville (NJ) around 5 PM on 5/22. It will continue this journey down CSX's Trenton Line on Sunday (5/23). I was told that its final destination will be Algiers, Algeria, a country located in North Africa. Even though it's length and weight are unknown, previous heat exchangers have weighed in around 600,000 pounds and measured 145 feet long. Motive power for this move was NS 3438 (ex-CR 6984) and NS 5664. Bringing up the rear markers was Air Products caboose APTX 2002. The Tri-State Railway Historical Society invites you. The Tri-State Railway Historical Society will be hosting a Slide Show covering the Erie-Lackawanna Railroad main line between Hoboken and the Delaware Water Gap during the era from immediately after the merger (1960) until the New Jersey Cut-Off was abandoned during early Conrail (late 1970’s). 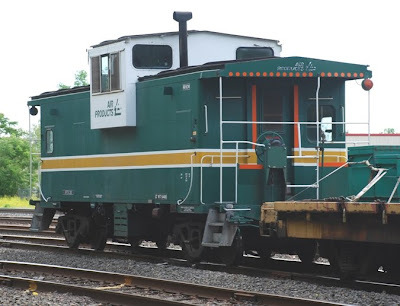 Coverage will include the final runs of the Phoebe Snow and Lake Cities passenger trains, and many freight trains, some pulled by F3’s like Tri-State’s future DL&W 663 in Scranton. An added bonus will be the addition of the Morris County Central 2-8-0 No. 385 on its famous fan trip runs between Morristown and Summit in the late 1970’s. This steam locomotive is today in Whippany in full Southern Railway lettering. The meeting begins at 7:30 PM with the entertainment beginning shortly after 8:00 PM. Admission is free. All are welcome. Received the following request via email. Please respond directly to Tom Rose as noted below. I'm doing research on the Becker Farm & Railroad in Roseland NJ, 1938-1972. Would you have any stories, photographs or 8mm film of the Centerville & Southwestern Railroad (miniature) on Becker's Dairy Farm? Gemstone Panning is a great activity for all ages. Participants may find up to 11 ounces of gemstones in a single bag which may include amethyst, rubies, rose quartz, emeralds, crystals, and an arrowhead. All gems are of high quality and may be suitable for cutting, polishing, and mounting. With every mine train ticket you will receive one bag of mining ore from the Ole' Susquehanna Mine. Fare includes Steam Train ride, mine history and instructions as well as one bag of mining ore guaranteed to contain 4 to 5 ounces of Gem Stones. Trains leave from Phillipsburg, NJ. With two days of sunshine and decent temperatures, Saturday and Sunday would be a good time to take advantage of Mother Nature's kindness and spend some time trackside. Doing that would also provided a escape for me, albeit a temporary one, from cutting grass and planting flowers. Saturday's trains started off with NS 11J at 8:37 passing by with 114 empty autoracks at the Roycefield Road grade crossing. Motive power consisted of NS 9498 and NS 9907. At 9:18, NS Intermodal 22V came through with its consist of COFCs. After mowing a lawn, I returned to the Roycefield Road grade crossing to see NS 64J haul its consist of empty garbage containers on to the Roycefield siding. Motive power was two SD40-2s, NS 3373 (ex-CR 6436) and NS 3424 (ex-CR 6520). Sunday's sighting at Stanton Station were sparse when compared to Saturday with one surprise. A late running NS 212 would have two UP units as the second and third units in its power trio. 212 would pass by Stanton Station aorund 12:30 with NS 9219 as its leader, followed by UP 9791 and UP 4297. All in all, not a bad day to be trackside and still manage to get all the grass cut along with all those flowers planted! WASHINGTON, D.C., May 18, 2010 - America's railroads today honored the industry's safety achievements and celebrated railroads with the best employee safety records at the annual E.H. Harriman Awards. According to the Association of American Railroads (AAR), 2009 was the safest year ever for railroads, with significant milestones achieved across the board in reduced train accidents, employee casualties and grade crossing collisions. Compared with 2008, train accidents and accident rates were down 25 percent and 12 percent respectively in 2009. Employee casualties and casualty rates were down 12 and 2 percent respectively last year compared with 2008, while grade crossing collisions and collision rates were down 21 percent and 9 percent respectively. "It is the tremendous dedication and hard work of our employees that makes rail the safest mode of transportation today," said AAR President and CEO Edward R. Hamberger. "Our industry continuously invests, innovates, improves and implements systems and technology that make our business ever safer." 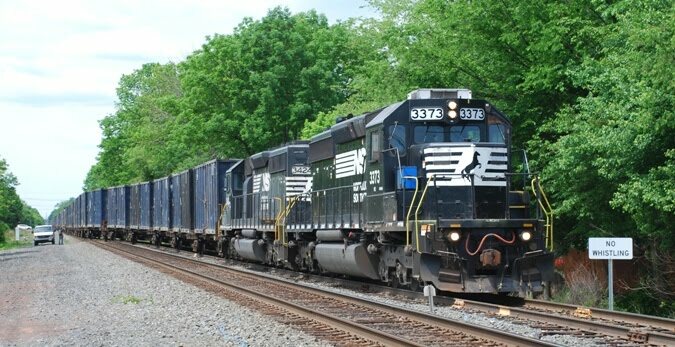 · In Group A, comprising line-haul railroads whose employees worked 15 million employee-hours or more, Norfolk Southern received the gold award for the 21st year in a row. CSX Transportation won the silver award and Union Pacific Railroad the bronze award. · In Group B, line-haul railroads whose employees worked 4 to 15 million employee-hours, the gold award went to Kansas City Southern Railway for the fourth year in a row. The silver award went to Metra, the Chicago commuter railroad, while the bronze went to Canadian National (U.S. Operations). · Group C includes railroads whose employees worked between 250,000 and 4 million employee-hours. The gold award went to the Buffalo and Pittsburgh Railroad, while the BNSF Suburban Operations took the silver and the Paducah and Louisville Railway the bronze. · In Group S&T, for switching and terminal companies with more than 250,000 employee hours, the Indiana Harbor Belt Railroad took the gold, while the silver award went to Gary Railway and the Birmingham Southern Railroad received the bronze award. Certificates of Commendation also were awarded to four railroads with continuous gains in employee safety improvements over a three-year period and showing the most improvement between 2008 and 2009. Certificates went to Union Pacific Railroad (Group A), Metra (Group B), BNSF Suburban Operations (Group C) and the New Orleans Public Belt Railroad (S&T). The Harriman Awards were established by the late Mrs. Mary W. Harriman in memory of her husband, Edward H. Harriman, an American legend in railroading. Today, the awards are administered by the E.H. Harriman Memorial Awards Institute, with support from the Mary W. Harriman Foundation. Harriman winners are selected by a committee of representatives from the transportation field and are granted on the basis of the lowest casualty rates per 200,000 employee-hours worked. All data is documented by the Federal Railroad Administration. NORFOLK, VA. - Wick Moorman, CEO of Norfolk Southern Corporation (NYSE: NSC), will address the Wolfe Trahan & Co. 3rd Annual Global Transportation Conference on Wednesday, May 26, 2010, in New York City during an 11 a.m. panel discussion. Interested investors can listen via simultaneous webcast at http://www.wsw.com/webcast/wolfe/nsc/. BNSF has launched an interactive "Virtual Train Tour" as part of its new website. It uses 3D images of railcars and is loaded with information about BNSF trains. Check it out at http://www.bnsf.com/tour. A BNSF train derailed on May 12, 2010, near Thermopolis, WY, when it hit a rock slide. Full story with pictures on a CNN iReport. Link below. A Day Out With Thomas Tickets On Sale Now! Tickets are now on sale for A Day Out With Thomas. R&N's dead head move to Tunkhannock, PA for Saturday's excursion. Testing on the C&S when it passed by!!! NORFOLK, VA. - Norfolk Southern Corporation (NYSE: NSC) performed well through the recession and has positive momentum for continuing success in 2010 and beyond, said Chief Executive Officer Wick Moorman during the company's 28th annual stockholders meeting, held today in Williamsburg, Va.
"The longer-term prospects for Norfolk Southern and the rail industry remain very bright," Moorman said. "Overall, our first-quarter 2010 performance reflects the strength of our high-value transportation product and operating efficiency, and provides a strong platform from which to build momentum throughout the remainder of this year. Against the backdrop of an improving economy, the stage is set for a good 2010." Moorman's remarks and a related video are posted on the company's Web site at www.nscorp.com. In official business, stockholders re-elected four directors: Thomas D. Bell Jr., chairman of SecurAmerica LLC; Alston D. Correll, chairman of Atlanta Equity Investors LLC; Landon Hilliard, a partner in Brown Brothers Harriman & Co.; and Burton M. Joyce, former chairman of IPSCO. Stockholders also approved a company proposal to declassify the board of directors, setting the stage for annual election of the full board, which will occur for the first time in 2013. In other business, stockholders ratified the appointment of KPMG LLP as auditors, approved amendments to the corporation's long-term and executive management incentive plans, and did not approve a stockholder proposal concerning disclosure of political corporate contributions. Take Mom on the Winery Train 10% off this weekend! Take Mom for a ride on the Winery Train and take 10% off of your order! Enjoy a wonderful trip to Villa Milagro Vineyards where you are sure to have an experience you will never forget. Round Trip train fare in the "Wine Train Car" on the Delaware River Railroad Excursions. A short 3 mile bus ride through the rolling farm land of Warren County. A vineyard tour, wine and cheese tasting and a free wine glass. Feel free to bring a picnic lunch and a blanket and find a comfortable place on the grounds for your lunch or relax on the vineyards front porch. At the Vineyard you will be able to purchase wines from their company store. Space is provided on the bus for your purchases and our crews will assist you with loading your car once the train returns to Phillipsburg. Visit their web site to learn more and to buy tickets online. Trains leave our station located at Market Street and the river, Phillipsburg, NJ, at 11:00 AM. Take Mom for a Train Ride FREE! This weekend Mom's Ride free! Simply present your mom at the ticket office for her complimentary ticket. Mom must be accompanied by a ticketed passenger. Visit their web site for more information and to buy tickets online. Another interesting article on this subject at the following web site. National Train Day, sponsored by Amtrak, is this Saturday, May 8th. For complete information, please visit the following web site. National Train Day was started to commemorate the Golden Spike event of May 10, 1869, when this nation was officially spanned by railroads. Please see the following web site for more information. 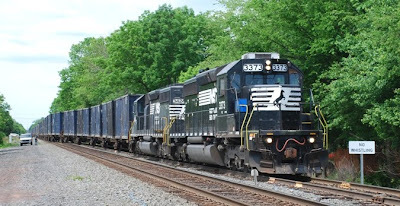 Floodwaters have receded and operations restored over Norfolk Southern's line between Memphis, Tennessee and Sheffield, Alabama. However, slow orders are in effect as track conditions are closely monitored. With improving conditions, operations should be gradually returning to normal over the next couple of days. Customers with shipments normally moving over this route should expect delays of 24 to 48 hours. Storms over the last weekend and into Monday resulted in flooding conditions in many areas of the Southeast, most with only minimal impact on operations. 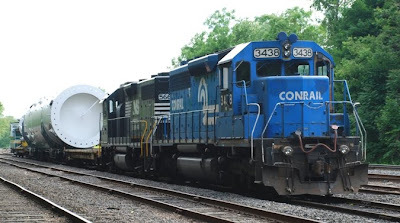 However, operations over Norfolk Southern's line between Memphis, Tennessee, and Sheffield, Alabama, have been discontinued due to flooding near the Tennessee-Mississippi border, west of Corinth. Some trains are being routed around the impacted area but customers with shipments normally moving over this route should expect delays of at least 48 hours. NORFOLK, VA. – Norfolk Southern Corporation (NYSE: NSC) announced today that 46 customers will receive the company’s Thoroughbred Chemical Safety Award for 2009 in recognition of their safe handling of hazardous chemical products. Given annually for 14 years, the award is earned by a company or facility that ships more than 1,000 carloads of hazardous material without incident for the year. In 2009, 38 corporations and eight plants attained that achievement. Altogether, they safely shipped more than 120,000 carloads of goods that are vital to American communities and commerce but could be dangerous if mishandled. These materials range from industrial chemicals and petroleum products to sulfur and related chemicals. ■ Akzo Nobel Chemicals Inc.
■ Aventine Renewable Energy, Inc.
■ Eastman Chemical Company plant at Kingsport, Tenn.
■ Green Plains Renewable Energy, Inc.
■ Olin Corporation Chlor Alkali Division plant at Nixon, Ga.
■ Olin Corporation Chlor Alkali Division plant at Charleston, Tenn.
■ PCS Phosphate plant at White Springs, Fla.
■ Sunoco Chemicals, Inc., plant at Frankford, Pa.
■ Valero Marketing & Supply plant at Paulsboro, N.J.
■ Valero Marketing & Supply plant at Reybold, Del.